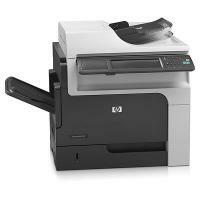 The HP Laserjet Enterprise M4555f multifunction printer aims at large and busier workgroups. The printer increases its productivity by delivering fast copy and print speeds. The printer comes with good management tools and paper handling capabilities. The printer supports high capacity HP Laserjet Enterprise M4555f Mfp toner cartridges, producing quality outputs. The device weighs approx. 75.5 kg and measures 825x1115x710 mm. It has a user-friendly control panel with colour LCD display. It features a flatbed scanner with ADF support. It has two paper trays, one is the input tray which can handle up to 1,100 sheets of paper and the other is output tray which can store up to 500 sheets of paper. The printer also supports additional paper input tray for high volume printing. It also supports USB 2.0 and ethernet connectivity. The printing resolution of this printer is up to 1,200 x 1,200 dpi with print speed up to 52 ppm. The printer supports automatic duplexing for double-sided printing to reduce the paper wastage. It features digital send, fax and HP ePrint, allowing users to print the documents with more convenience and efficiency. It is compatible with Windows, Linux and Mac operating systems. The HP Laserjet Enterprise M4555f printer includes many features such as automatic duplexing, USB 2.0 and ethernet connectivity, optional paper input tray, ADF support, digital send, fax and Hp ePrint technology. The printer also has high yield HP Laserjet Enterprise M4555f Mfp toner cartridges which help in saving money by reducing the cost per page. As a multifunction printer, it has optional Wi-Fi connectivity which results in the major drawback as compared to other competitors available in the market. How to manage the HP Laserjet Enterprise M4555f Mfp toner cartridges? Print-quality problems can occur when using a supply that is at its estimated end of life. The printer displays messages for low ink level and for end of the toner. If the printer displays a Black Cartridge Low message, it indicates that the print cartridge is nearing the estimated end of its useful life. You can continue printing here until the Black Cartridge Very Low message appears. This indicates the end of the toner in the cartridge. You should probably replace the toner once this message appears on the printer. From the Home screen on the control panel, touch the Administration button. Select the Continue option to set the product to alert you that the HP Laserjet Enterprise M4555f Mfp toner cartridge is very low, but to continue printing. Select the Stop option to set the product to stop printing (including printing faxes) until you replace the print cartridge. Select the Prompt to continue option to set the product to stop printing (including printing faxes) and prompt you to replace the print cartridge. You can acknowledge the prompt and continue printing. When the product is set to the Stop option, there is some risk that faxes will not print after the new cartridge is installed. It depends on the product memory. If your product has received more faxes than the memory can hold while the device is stopped the exceeding faxes might get lost. When the product is set to the Prompt to continue option, there is some risk that faxes will not print after the new toner cartridge is installed. That is when your product has received more faxes than the memory could hold while the product is waiting for the prompt to be acknowledged. Q. Being the owner of a printing shop, I have purchased HP Laserjet Enterprise M4555f Mfp printer. But after sometime, the printer started producing poor quality prints. What could be the reason? Replace the HP Laserjet Enterprise M4555f Mfp printer toner cartridges. Inspect the toner roller to see if the roller is damaged. If it is damaged, replace the toner roller. Adjust the print density, and disable EconoMode in the device Properties. A. The printer is compatible with Windows, Linux and Mac operating systems. Q. What are the paper capacity of the input tray and output tray of this printer? A. The input tray can handle upto 1100 sheets of paper and the output tray can handle upto 500 sheets of paper. The printer also supports additional paper input tray for high volume printing. Q. Do you provide any special offer or discount? If so, how will I get the information related to the latest products and special offers at your site? A. Yes, we do have special offers. When you buy a product from our site for the first time, we provide 10% discount. During first purchase, you can use coupon code - D10 to avail the offer. We may ask you for your personal information during payment so that we can provide you with the best possible service. We may send information on the latest products or special offers for which we might contact you by email or phone. Q. Does the price of the compatible HP Laserjet Enterprise M4555f Mfp printer toner cartridges listed in your site include delivery charge? A. Yes, the price of an item does include delivery charge. The same price is applied to delivery. Q. Are the HP Laserjet Enterprise M4555f Mfp printer toner cartridges available at your site tested? A. Yes, the toner cartridges available at our site are factory tested to the same ISO standard as the original brands. Q. Why there is need to print a cleaning page? A. During the printing process, paper, toner, and dust particles might accumulate inside the printer and can cause print quality issues such as toner specks, smears, streaks, lines or repeating marks. Thus, we need to clean the printer on regular basis to avoid such issues. A message will appear on the printer control panel display while cleaning is taking place. The cleaning process may take a few minutes to complete. Do not turn the printer off until the cleaning process has finished. You may need to repeat the process on regular basis to clean the printer. Print a few more pages to see if the problem gets resolved. Q. What are the precautions to be followed while storing the print cartridges? A. Do not remove the HP Laserjet Enterprise M4555f Mfp toner cartridges from its package until you are ready to use it. To prevent damage to the print cartridge, do not expose it to light for more than a few minutes. Q. I need to contact with the administration for the help. Where can i contact regarding the purchase i have done? A. If you require any assistance please do not hesitate to contact us via our Live Chat. Our friendly knowledgeable staff will be happy to assist you with your enquiry. If you are experiencing a problem with an ink cartridge or toner, you may find the answer to your query. Q. My cartridges are close to its finish of expected life. How can i replace the HP Laserjet Enterprise M4555f Mfp toner cartridges? Pull the top cover release lever and grasp the handle of the used print cartridge and pull it out to evacuate. Store the used cartridges in a protective bag and remove the new ones from the pack. Be mindful so as not to harm the memory tag on the print cartridge. Grasp both sides of the cartridge and distribute the toner by gently rocking the print cartridge five or six times. Align the HP Laserjet Enterprise M4555f Mfp toner cartridges with its slot and embed the print cartridge until it clicks into place and then close the top cover.